You should read this book before you purchase a new computer. It will lead you through the many factors which you should consider. Unfortunately, when you go into a computer box store, many sales people are more interested in making a commission than on selling you something that best fits your need. Unless you have a lot of money and are trying to impress your friends and neighbours, you can save yourself from overspending on features which you really don’t need. This book will take you "under the hood"of the typical personal computer and show you what makes it run. It also covers the boards and cards which you may need and it tells you how data is stored and what to look out for. A basic question is whether you want to stick with a desktop or have the advantages of being mobile. You can take a tour of monitors, modems, keyboards, mice, graphic tablets, voice controls and touch screens. Learn about scanners and how you can use Optical Character Recognition software to import paper-based documents or faxes into your word processing program so that you can edit them or manipulate them. Take a look at computer printer technology and how to select the most suitable printer for your needs. You’ll also learn how to create your own network; the importance of surge protection and power backup. It also shows you how to engage in long distance phone conversations for free. This book reviews the different operating systems and give you a brief summary of the different software suites of programs. It takes a look at some of the things you will need to know for getting pictures and videos into your computer and some of the new technology which may revolutionize the games industry. Find out how to calculate your total cost of ownership and be alerted to some of the "hidden" costs. The final chapter puts it all in a nutshell--how to select the right computer for your needs rather than listening to all the hype in your local computer store. Chapter 2: Take a Look Under the Hood What Makes Your Computer Run? Chapter 12: When Lightening Strikes! Don't Let Your Data Get Zapped Out! Chapter 13: Talk Long Distance Over the Internet by Phone: For Free! 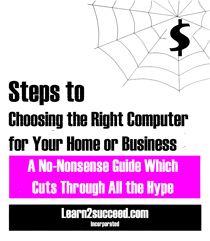 Steps to Choosing the Right Computer for Your Home or Business: A No-Nonsense Guide Which Cuts Through All the Hype by: Learn2succeed.com Incorporated: Softcover; 96 pages; ISBN: 978-1-55270-454-7 published in 2012; $17.99.